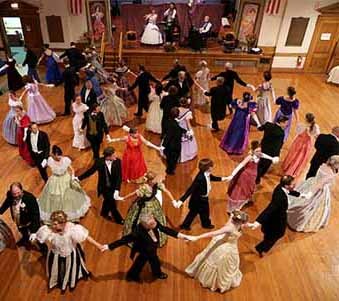 Vintage Victorian and the New England Vintage Arts Society present an unforgettable weekend of dancing and amusements in one of America’s oldest summer resort towns in enchanting period venues amidst refreshing ocean breezes. Don’t miss this wonderful opportunity to experience a summer holiday as it might have been during the Victorian, Gilded, Ragtime & Jazz ages. We hope you'll be able to join us! Some scholarships & work exchanges are available for students, please email us for more information; volunteer positions are available too, help is always needed. We strive to make the event accessible for all. 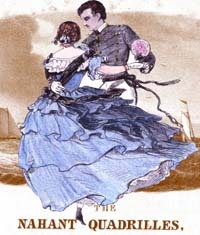 The weekend has been organized for over two decades by Katy & Ben Bishop to share their love of vintage dance and recreate the activities of nineteenth century social life, and is sponsored by the New England Vintage Arts Society to help preserve Nahant’s past as one of America’s first Summer resorts. We could not do this weekend without our volunteers and the assistance of our family and friends. Some venues and services are donated to help keep the costs down, ensuring that everyone can afford to attend. We hope you’ll be able to join us! Come for the whole week or just a few events. Daily a la carte pricing will open as space allows. The following is information from 2018 to give you an idea of what the schedule will be like in 2019. We are adding more class time on Thursday, and moving the dinner dance to Friday, with live music for dancing with Dan Levinson and Dan Gabel as part of our own Nahant Dance Orchestra, and the silent film, with live accompaniment by Jeff Rapsiss will be on Thursday evening to ease us into the weekend. We will also be offering the option of ordering lunches to allow attendees more time to relax and enjoy Nahant. 4 day weekend includes ALL events and classes listed below. 3 day weekend includes all events Friday, Saturday, and Sunday. 2 day weekend includes all events Saturday, and Sunday. Friday dance only also includes that day’s classes. A la carte day and evening event options will also be available as space permits, email for details. THURSDAY: Nahant Knights of Columbus, with a stunning seaside view of Boston. FRIDAY: Daytime events at the Knights of Columbus, evening dinner dance at the Nahant Country Club. Monday we will be adding an morning outing to Zimman’s fabrics in Lynn, a must see detination for exquisite silks, wools and linen. Afterwards many of our dancers will be heading to Providence for the Summer by the Sea dance week. Visit our event page for more details and a complete schedule. As with all our events, period dress is greatly admired but not required. Children are welcome if well behaved and supervised. We will offer a few hotel room blocks to choose from. There are no hotels on Nahant itself, these are the two closest hotels and a B & B with easy access to Nahant, there are also many Air B & B listings in Nahant, Lynn, Swampscott, and Marblehead within easy driving distance of Nahant. Please email us if you have any questions.